Dexter has been "Mr. Photogenic" lately. Sorry kitties, but if ya don't sitz, I can't shoot ya, capisce? Red Trillium Farm. Mom got a very special hot cocoa mix from Kings Road Apothecary with healing herbs and mushrooms (yes, mushrooms) in it. It was very delicious and nutritious and took just about a teaspoon of honey to make it sweet. And don't worry, while Dex enjoyed some whiffies, we all know that kitties and cocoa don't mix so there were no "shares-ies"
a bit more cooperative with the flashy box. I'll be happy to post 'em if they pose ! Valentine's Day is a very special day for me. You see there are three really important "Valentines" in my world. The first Valentine girl in my life, was my little sister who the rescue people called "Valentine". She was a little black kitty with a white heart on her tiny chest. 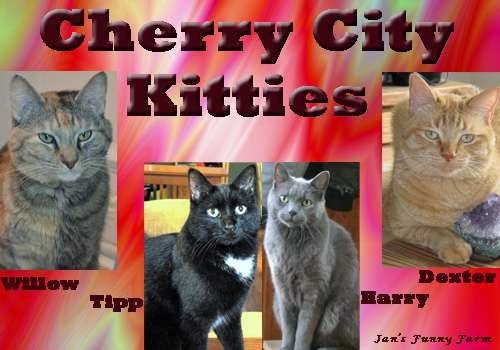 We were found when we were very tiny, our dear momma had been hit by a car and went to the Rainbow bridge. We were so lucky that there was a really pawesome lady that took us in and fed us with a little tiny bottle while we were growing up. Valentine and I , my name was Marmalade back then, played and snuggled and shared a place with some other kitties, but when we were just about 8 weeks old we went to a big place with lots of people and bright lights and woofies on some days and people came to look at us and would give us little scritches under the chin and talk sweet to us. It was at this place where I met the second Valentine in my life... my Mom Carolyn. She and Dad Mark were visiting the big place, it looked like they had a big bag of nommy food with them, so they must have had other kitties to feed. They were visiting the other kitties, giving them scritches and talking kindly to them and then... our eyes met... I looked at her, she looked at me... Dad Mark said... "do you want to see him?" Oh, she saw me all right, what she wanted to do was hold me. She picked me up, I snuggled in and purred and Dad Mark said... "Do you want to take him home?" Home? It was too good to be true! This was the forever home the lady had told us about! She told Mom and Dad not to worry, that my sister would stay with her until she found a forever home and would never be alone. Valentine and I looked at each other, I knew she was happy for me and I was happy she would still be looked after, and I was off to join my new family. Oh, are you wondering why I call my Mom my second Valentine girl? Because my gotcha day was Feb 14th 2009, and my new Mom said I was the best Valentine present ever. Of course, the feeling was mutual! So now we come to my third Valentine girl. And I think you all already know who that is. Yep, it's my sweetie, the prettiest little floofy ginger princess in the blogosphere, Miss Pia Bean Cole. I felt like the luckiest mancat in the world when Pia told everyone of her huge crush on me, and... well... it was no less than my love for her. She is far away from me, but we hold each other dear... Mom keeps her picture on our computer screen so I can see her, and we read the Colehaus Cats blog together all the time. It's like she's right here with me. Three Valentine girls, my sister, my mom and my 'lil bean. Three special girls that fill my heart every day with all the love I could ever need. Yep... I AM the luckiest mancat ... no doubt about it! I love you all my girls! 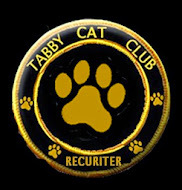 We're so honored they featured us and we want all of our friends to drop by and check it out! 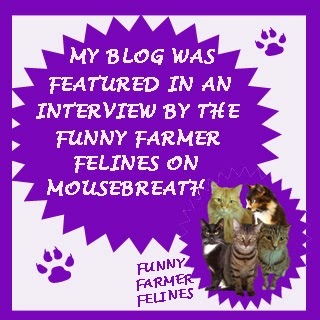 Stop by and visit the Funny Farmer Felines gang and help us say thanks for the feature on Mousebreath!